Swarovski 3mm Dark Sapphire bicone beads are ideal for use as spacers and accent beads and are wonderful, glittery additions to earrings. INM Crystal is pleased to offer these 3mm Xilion crystal bicones in a brilliant array of colors and finishes to add eye-catching sparkle to your strung or stitched jewelry pieces. Swarovski crystals are considered the finest crystal beads in the world. 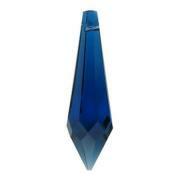 These crystal beads are precision machine cut and polished to the highest standards of quality. Swarovski Crystal Bicones are Swarovski’s best selling crystal beads and are available in an extensive variety of colors and special effects. As of 2009, the Swarovski Series 5301 Crystal Bicones are being replaced by the Series 5328 Xilion Crystal Bicones, which have an increased number of facets for higher brilliance and more intense light reflection. These unique Swarovski Crystal Bicones look extraordinary on their own or as brilliant accents between other beads and will make a striking addition to your jewelry designs. This product was added to our catalog on Tuesday December 01, 2009.